We finally managed to get our tree decorated on Saturday. 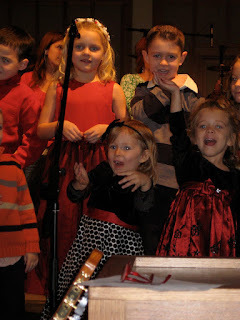 On Sunday Abby was in her first Christmas program. The kids recited a poem and sang a song. She did very well, and we received several comments about her performance that morning. Having been placed directly under a microphone, and not being shy, it was no surprise everyone heard her loud and clear! You can see that the video starts shaking because Dustin is laughing. We will have Christmas dinner with my family, and then my sister and her family will be staying with us for a few days. Abby is very excited to see her cousins again! It's been over a year since we visited them in North Dakota. We plan to take lots of pictures and try to post them here. As far as pictures from our trip, we have LOTS, so it may be a while before we can get them organized and in a good format to post here. I'm sorry it's been so long since we have been able to write to you. The short explanation is that our computer has finally, after two months of trouble, succumbed to hardware failure. We are glad that the hard-drive appears to be undamaged, so we haven't lost everything on it. In some ways the failure is a relief, as the intermittent problems caused a lot of stress, and now at least things are settled. As strange as it may seem, a computer seems to be even more necessary here than back home in the States. We are very thankful that we have been given another computer to use while we are here, although it is an older system. Please pray that we will have wisdom to know how to deal with this situation when we return home. Because of this, we haven't been able to complete a newsletter for some time, and now that our computer is completely out of commission, the work that had been done is inaccessible. The last month has been eventful. I have stayed busy at the hangar with all sorts of projects. For the last two weeks another mechanic and I have been working on a rather involved repair to a Cessna 206 wing which was damaged several months ago. We replaced almost all of the parts in the outer half of the wing with new ones; riveting on new spars, skins, leading edge, rib, and stringers. By the time we leave the wing should be painted and back on the airplane, hopefully completely rigged and possibly even flying. 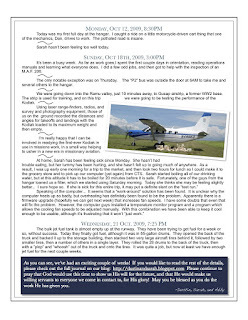 When the airplane is serviceable it will be transferred to a missionary pastor and pilot who is beginning work in an otherwise inaccessible area. Sarah has been staying busy as well. Along with the full-time work of a third-world wife and mommy, she has begun working in the linguistics department three mornings each week. Her job consists mostly of formatting and quality checking completed Bible translations for inclusion in a database-type website. While Sarah works, Abby enjoys going to the daycare here, where she gets a lot of good interaction with other kids. Other than the routine of daily life and work, we have had some opportunities to get out and see Papua New Guinea outside of the center. I had the chance to go out to a nearby village with one of our friends and show the movie "The End of the Spear" in their church. Although the church building is visible from where we live, the twenty-minute drive was far from smooth, and electricity was provided by a portable generator. We went with prayers for protection from an infamous outlaw who was rumored to be in the area at that time. Due to these rumors, we decided to avoid driving at night, and instead stayed with one of the church leaders in a "bush house." For those of you who picture missionaries living in grass huts... that is an accurate picture in this case. We also had an opportunity to visit the city of Lae, accurately self-proclaimed "pothole capital of the world." We enjoyed seeing what things are like down on the coast, and staying at the SIL guesthouse there. At these tropical latitudes the lower elevations are very hot and humid, so we really appreciated the swimming pool, especially Abby, who got to "swim" on her own with floatation "wings." On the way we also got to visit some translators in their "village house." This weekend has been busy as well. Friday night we enjoyed a community production of the world-famous "Fiddler on the Roof" musical. When you live literally in the middle of nowhere, a bit of entertainment every once in a while is almost necessary to sanity, and everyone can be involved. Sarah and I actually spent an hour or two helping with the set construction. It differed from any other production I've been to, in that before they began the director came on-stage and prayed for the production and for the protection of our homes while we were there... there have been one or two break-ins and thefts each week recently it seems. Anyway, the talent and creativity that went into it paid off... it was an amazing evening. Saturday morning I went on a new adventure, taking my first ride on a "PMV" (Public Motor Vehicle), which is the main form of transportation for Papua New Guineans. I went to the local center of Kainantu with a national friend from the hangar, Philip. Our ride there was in the back of a large flat-bed truck known as a "Dyno." As it was quite full (I counted 41) we rode sitting on the edge of the low railings. I was a bit worried about falling out, but arrived without incident. We spent the morning wandering through the various shops, most of which are owned and operated by asians and carry essentially identical inventories of food staples and cheaply produced electronics. One exception is the Christian book-store, where I bought a map of the country and large PNG flag. After a snack of heavily-breaded deep-fried sausage, we waited about two hours ("PNG time" I was told) for another PMV, this time a fully-loaded van, to take us back home. Much more has happened in the last month, but most of those stories will have to wait until we get back. It's hard to believe that in only a little over a week we will be "moving out..." Two months have gone by so fast! Our time here has been everything we hoped it would be. We have learned so much and been able to serve in ways we had never expected. When we get back we will certainly have a lot to think about and pray about! We will be flying out the morning of December 2nd to the PNG capital of Port Moresby, where we will wait most of the day for our evening flight out to Cairns. We are glad to have two nights in Cairns, at Treetops Lodge again, where we will be able to spend a little time with some friends who will be leaving here this weekend for pregnancy leave. Since before we even left the U.S. Sarah has been looking forward to holding a Koala, and so we will be planning to make a visit to an Australian zoo during our brief stay as well. When we leave Cairns, it will be the beginning of the longest traveling time on the entire trip... We will go approximately 6 hours from Cairns to Auckland, where we will only have an hour before embarking on the 13-hour trip to San Francisco. After a three hour layover we are off to Portland, where we will almost certainly arrive completely exhausted. Twenty-four hours of travel with only brief stops, and against the time zones, is not something we are looking forward to. Please pray for us as we pack up and say our goodbyes, and especially while we are traveling. Also, thank you for praying for Abby and her issues with obedience. It seems that prayer has been answered. Please pray for Abby as last night she came down with a croup sort of a cough and breathing trouble. Although this morning she seems to be feeling better, she still has the cough, and none of us got a lot of rest. We are looking forward to seeing all of you soon! Thank you for your continued prayers. Please feel free to send e-mails... we would love to hear how all of you are. What a day! We finally got on the Kodiak and got rolling (after the pilot forgot to remove the chocks). There was no seat for Abby- she sat on my lap. Before we rotated she was asleep, and slept for about half the flight. It was incredible... seeing trees that only grow in jungles, and villages of grass huts, and mountainsides of hand-tilled gardens. 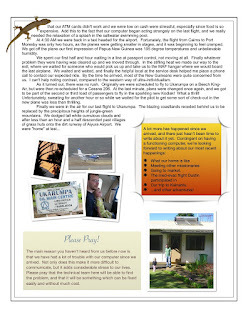 We landed on the dirt strip, and were finally "home." Janine Lyninger and our fellowship family, Scott and Sarah Carey, were there to meet us at the airport and help get us moved in to Translator Lodge 3A. It is a duplex, with no one currently on the other side, and probably as large or even larger than our house in Canby. Newcomers in Ukarumpa are assigned a “Fellowship Family” (in our case Scott and Sarah Carey) who take care of them and help them get oriented. Residents also signed up to have us over for lunches and dinners for the first three days, which was a very welcome rest! We had Kristen Brewer (Jeff Brewer is in aviation) stop in with peanut-butter bread and say hi. Everyone is so nice! We finally got settled, and then it was time for dinner with Dave and Melissa Raube and their 7 (!) kids. What a fun circus! 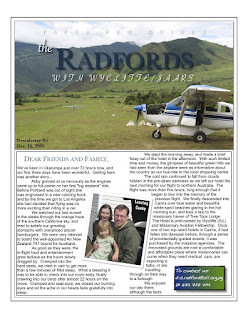 We rattled over to their house in the Carey's Hilux over the steep and potholed dirt roads. This place is beautiful though, with tropical birds singing, everything green and growing, and a perfect breeze in the 70 degree weather. At the Raube's Melissa was making tortilla chips... deep frying tortillas she cut in stacks with scissors. The tortillas had been made earlier by a "house mauri." We had a delicious meal of white-sauce enchiladas and chips and salsa to the accompaniment of stories about the outlaws and gun-fights that go on round-about, punctuated by half a dozen distant gunshots at irregular intervals. (just as I was brushing my teeth I heard three more on this side of the compound). Apparently no one is too much bothered by this. While we waited for brownies there was a major brownout. Candles were lit, but unfortunately an accident with one of the kids landed the nearly-done brownies in the bottom of the oven... so we had just ice-cream (which was quite good anyway). Abby had got a scare from something one of the boys told her while they were playing in the other room, but finally recovered after the lights came back on. Abby has already started making friends, and I think we're all going to like it here. What a delightful time we've had. I don't know how better to describe it. So much has happened since Thursday that I can barely remember details. We had lunch with our fellowship family, Scott and Sarah Carey. She was in linguistics before they got married, and helps out one day each week with translators. He is head of the math department at the high school. They have two kids around Abby's age. They were kind enough to loan us some toys. We took the computer in to CTS also. They had some trouble with it, as we had, and changed out the memory chips. They thought they had solved the problem... however, it seems that something else is amiss, as it is locking up when it gets hot... and it does get hot. Thursday evening we had dinner with Julianne Spencer and her friends Benji and Esther. Julianne does survey work... very adventurous stuff. She's the one whose photos we used on our newsletter, and friends with Kristy from San Diego. He place was very clean and modern. It seems that whatever sort of home you would have back "home" you could also have here. We had a fun time. Benji and his wife are newly married. He grew up in Ukarumpa, and she is also a MK... as are many of the people here. He is the "youth pastor" so to speak. Friday morning we went to the market with Scott. It was interesting, and reminded me a lot of Africa... but bargaining is not a part of the culture here. We got a few veggies... the selection is incredible! We stopped by housing, finance, and CTS on the way back, then went down to get some much-needed groceries at the store. It was the last opportunity, as they are closed for the weekend. At lunchtime we had a very long walk over to the home of Christopher Clark and family. It's funny, we've had enchiladas for two dinners, and we had tacos for lunch at their house. Christopher is a pilot, and after lunch I went with him up to the hangar, where I got a mini-orientation and actually got my hands dirty pretty quickly. I will be back there full time on Monday. There is certainly plenty that needs done there. I left early, at 3, and picked up our computer. 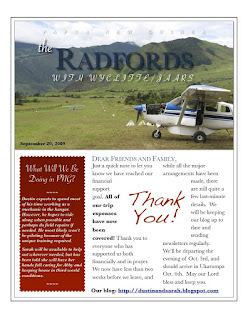 We had a little time to send a brief e-mail to parents before heading off to dinner at Michael and Sarah Johnson's house... just as long a walk as lunch if we hadn't hitched a ride halfway with Raubes. We had a great time with them. They have two girls just a bit older than Abby, and an older boy. 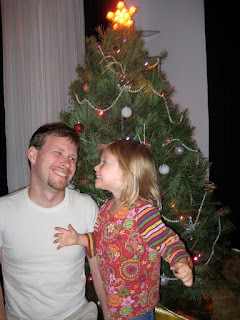 It was nice to be able to commiserate about parenting a bit. They also had James (pilot) and his wife Natalie over. We had a great time, and it was sad to have to walk home, but the girls were all getting tired. Today was very exciting as well. I got up early and went on a "joyride" with MAF pilot Remi W. to Sangapi on a medical evacuation. They have a clinic there, the condition of which would horrify any westerner, but which is much better than nothing. A national lady was evacuated for an ectopic pregnancy to Madang. It’s an amazing feeling to think that what you’ve done has saved a life. Had Remi refused to work on Saturday, she most likely would have died. I actually got to do a lot of the flying, and it was challenging stuff. The flight from Aiyura to Sangapi wasn’t gorgeous, flying around and over broken/scattered clouds over the sea of green mountains, through passes, and over incredibly high ridges. The cramped quarters of the runway would give any pilot either wonderful dreams or nightmares. I got to do all the flying until the last few hundred feet. The Robertson droop-aileron/flap mod brought the airplane down slow. As we came over the end of the runway I was very honestly momentarily afraid that we were going to catch the main wheels on the edge. We must have touched down no more than twenty feet onto it. The airplane was slowed and stopped before we had gone more than 300 feet. We picked up the woman, her husband, and their young daughter, I would say three years old. She was hysterical about being on the airplane, but (as Remi predicted) as soon as the engine started she quieted. He let me do the takeoff and climb out, over a ridge that I would never have guessed we could have out-climbed. 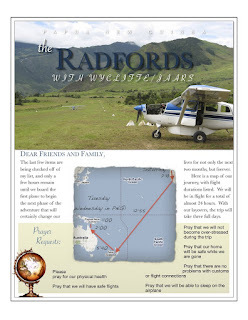 In fact, I did all of the flying, even to the landing in Madang, although he had his hands on the controls as well. After the family went away in an ambulance, and the plane had been refueled as necessary from a 55-gallon (200 liter) drum, Remi took me on a tour of Madang. It is a favorite vacation spot for missionaries, and he showed me all of the favorite places to go. Although it is hot and humid, it is not nearly as bad as Port Moresby, and the coastline is beautiful. The water is crystal clear. I can see why it would be a nice change from Ukarumpa once in a while. We took off about 11AM and headed back toward Ukarumpa. Thanks to Bergmans, I had a little idea of how the Garmin 430 works. It was absolutely necessary for our flights. We put the turbocharger to good use (absolutely necessary in this part of the world), climbing and climbing, trying to go over the clouds VFR. We ended up in a valley of clouds, several times having to pass through them briefly. As we climbed to 12,000 feet over the passes, the Garmin showed a terrain warning... mountains beside us that high! Finally we found a hole, and squeaked through, down toward Aiyura Airport. We did a straight-in approach, not approved by SIL, dropping down full flaps and side-slip over the mountain at the end of the runway, and I landed, flaring high, and coming down in what would have been a poor 180 landing, but was salvaged by a bit of extra power and the tricycle landing gear. I’ll blame the landing on the visual oddity of the uphill runway. What a great time! Sarah cooked her first dinner here that night - tuna casserole.... mmmm. Sunday morning we all got up bright and early to wait until church... It doesn’t start until 10:45. It was a pretty nice morning until about half-way through the service, when it began pouring rain in buckets. It’s been soggy ever since, and the laundry Sarah did Saturday afternoon is still not dry. The service was interesting. Apparently people in the community rotate through a sort of council which picks leaders for worship and the message. Ever week it is different. This Sunday it was a Lutheran who led worship, and the songs were all hymns I love, and the prayer and scripture readings very scripted and liturgical. The speaker was an older Australian fellow. We sat in the back, where the families with children sit (there is no “children’s church”), so it was a bit noisy and hard to hear. We slogged through the mud back home to take the dripping clothes off the line, and moped about all afternoon. 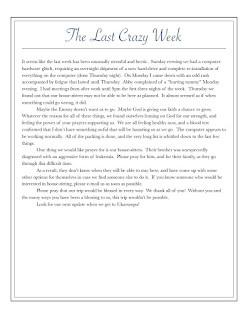 The computer was most certainly on the fritz, but I was making a valiant attempt to get our newsletter finished, and finally did. It seemed that we had only a certain amount of time to use the computer before it would fail, then we had to wait until it cooled down before we could use it again. In the afternoon I took a walk back to the meeting house through the mud to get my Bible, which I’d forgotten. Unfortunately, it was locked, but I took the opportunity to take a tour around the perimeter of the center. It was a long way! I had no idea how big this place was, and was also surprised by how winded I got, much due I think to the mile-high altitude. After dark I slogged again through the rain, and caught the last part of the evening goings-on at the meeting-house. 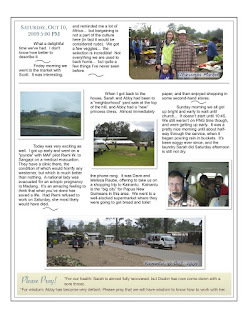 It was a report by a couple who recently finished a Bible translation. Very honest... goods and bads. Encouraging in that as well as in the good which came of it all. Today was my first full day at the hangar. I caught a ride on a little motorcycle-driven cart thing that one of the mechanics, Dan, drives to work. The potholed road is insane. We started off the morning with a Monday devotions and prayer time. Next I was given most of the remaining orientation by the new shop foreman, a fellow who can’t be much older than me by the name of Paul. He seems a nice guy, and easy to get along with. I got to go home for lunch, which I enjoyed briefly. Sarah hasn’t been feeling too well today. When I got back to the hangar I spent much of the afternoon reading ops manuals. They seem a lot like part 135 manuals back home, except they cover every possible aspect of what happens in the Aviation department. Fortunately, Paul came and rescued me by sending me to find out what was leaking on the 206 I’d helped look at Friday. It didn’t look to us like it had been leaking anymore at all, but there was another squawk to work on, which was a failed engine fire probe. I’ve never seen before, two OAT-type probes, one on the inside of each cowl-flap hole. Good idea, I guess. By the end of the day I was still working on repairing it, as apparently we didn’t have any new ones in stock, and the problem appeared to be insulation chaffed off the wires. When I got back home I was just in time for the CTS technician, Loren, to show up, bringing back our computer with the report that although he’d removed a likely-faulty printer driver (I don’t doubt it), he couldn’t make it crash. We hooked it up, and in about an hour it crashed again. Sarah suggested that it could be the dial-up modem. I unplugged it and restarted the computer. So far, more or less glitch-free except for a pause from I-Tunes. Well, it is getting late. Apparently we are beginning to finally adjust to the time. I slept all night last night, and now I’m up after 9 and still feeling all right. It’s been a busy week. As far as work goes,I spent the first couple days in orientation, reading operations manuals and learning what everyone does. I did a few odd jobs, and then got to help with the inspection of an M.A.F. 206. It was the same one that I had gone to Sangapi in. The only notable exception was on Thursday. Thursday morning I was up by 5:30. The “P2” bus was outside the door at 6AM to take me and several others to the hangar. (Officially the Aviation bus, but called “P2” because all of the aircraft registration numbers in PNG start with “P2”). By 7:30 a group of mostly pilots had got the Kodiak and a 206 loaded and ready to go. By “loaded” I mean that I loaded about 1000 pounds of sandbags into the Kodiak. 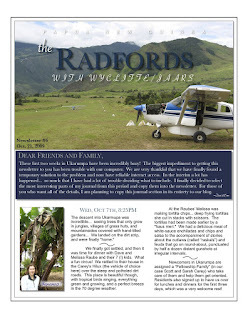 We were going down into the Ramu valley, just 10 minutes away, to Gusap airstrip, a former WW2 base. The strip is used for training, and on this trip we were going to be testing the performance of the Kodiak. Using laser range-finders, radios, and survey and photography equipment, those of us on the ground recorded the distances and angles for takeoffs and landings with the Kodiak loaded to its maximum weight and then empty. Gusap is at 1400’... Ukarumpa is at 5100’. What a difference! By noon the tropical sun was beating down on us, and even with a considerable breeze the heat was becoming almost unbearable. Humidity must have been about 100%. Although I enjoyed the trip and the chance to do something new, I was glad to climb back into the 206 for the trip to Ukarumpa. The cool breeze at Aiyura was delightful. 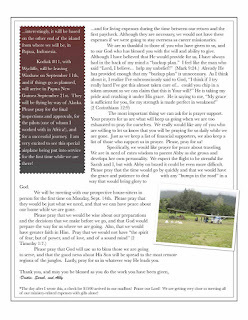 I’m really happy that I can be involved in readying the first-ever Kodiak in use in missions work, in a small way helping to usher in a new era in missionary aviaiton. Friday night was “hamburger night.” The teens on center put on “hamburger night” most Fridays to raise money, and it is the only opportunity for a family to get a chance have someone else do the cooking. Since Sarah was feeling ill anyway, we took advantage of it. Unfortunately, Burgerville beats the food hands-down... but the nearest Burgerville is half a world away, so we were thankful for what we got. After Abby was in bed I walked up the hill to a new friend’s home and spent the evening with a helicopter pilot, a village translator, and an on-center translator administrator playing board games. We played two rounds of a complicated little game called “Puerto Rico.” It had hundreds of tiny parts, which I love. It was a lot of fun. Saturday we went to the center library. It is only “regularly” open for a couple hours Saturday afternoons. It’s not big, the books are beat-up, and the card catalog isn’t very good, but we did borrow a few books. Many of the paperback books don’t even get “checked out,” but are simply labeled as belonging to the library, and expected to be returned when you finish with them. Since it gets dark about 7:00, and there’s no where to go anyway, the books will be a wonderful evening entertainment. Just a quick note... I’m glad to say Sarah seems to be feeling better. She’s not completely back to 100%, but certainly a lot better than she was. The computer, now that we’ve got ADSL hooked up, is quite fast enough to get things done on, although not nearly as fast as in Canby. Yesterday we had dinner with Tom and Marilyn Kelley, and this evening we enjoyed the Wycliffe Associates weekly potluck. I’ve got to ride to work and back with Steve Parker in his “buggy” the last couple days... what a blast! The P2 bus seems to average no more than 25mph, while the buggy feels like at least 50mph on the muddy/dirt road. On the way home today (in the rain) Steve let me drive, which was an absolute blast! The little motorcycle-powered two-seater is designed for racing, and the air shocks and grippy tires, along with the light design, make it the fastest thing around. Working on the Islander today and yesterday. More work on the Islander today. It looks like Sarah is back to feeling like her normal self, and I feel like I’m successfully fighting off the remains of a sore throat. The bulk jet fuel tank is almost empty up at the runway. They have been trying to get fuel for a week or so, without success. Today they finally got fuel, although it was in 55-gallon drums. They opened the back of the truck and backed it up to the storage building, then stacked two very large aircraft tires behind it, followed by two smaller tires, then a number of others in a single layer. They rolled the 28 drums to the back of the truck, then with a “plop” and “whoosh” out of the truck and onto the tires. It was quite a job, but now at least we have enough jet fuel for the next couple weeks. next two months, but forever. layovers, the trip will take three full days. It seems like the last week has been unusually stressful and hectic. haunting us as we go. The computer appears to be working normally. house-sitting, please e-mail us as soon as possible. us, this trip wouldn't be possible. 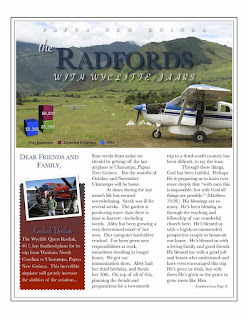 Look for our next update when we get to Ukarumpa! you to everyone who has supported us both financially and in prayer. Ukarumpa Oct. 6th. May our Lord bless and keep you. What Will We Be Doing in PNG? version, it is at the bottom. difficult, to say the least. us trials, but with them He's given us the grace to grow more like Him. need, and at just the right time. 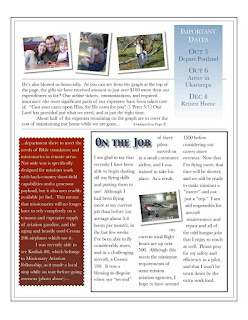 to stay overseas as career missionaries. is sufficient for you, for my strength is made perfect in weakness!" keep a list of those who support us in prayer. Please, pray for us! would bring glory to God. of our ministry-related expenses with gifts alone! place. As a result, my current total flight hours are up over 500.
down by the extra work load. heavily used Cessna 206 airplanes which use it. other end of the island from where we will be, in Papua, Indonesia. of PNG (Papua New Guinea)! we will more than likely need nothing more than beds. getting another round of passport photos, those will be in the mail. nervous to put our three passports in the mailbox. and arrows until police intervened! aviation as its primary objective. but before we're committed, there might be a few adjustments to make. working in the aviation department. transit three days each way! lifetime, is the entire point of this trip. we still won't have enough. One we thank for all things. He will provide. If you would like to donate money feel free to give to us directly. account set up with Wycliffe which we will be using during our trip. 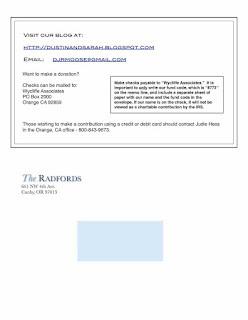 Our personal fund code is: 8773.
should contact Judie Hess in the Orange, CA office - 800-843-9673.
would like to be removed, please let me know. be able to include some photos and other information there as well. blog. We are also on Facebook, and welcome phone calls or letters. Airmail letters from the US take 12-14 days to reach Ukarumpa. for two months or know someone who may be, please let us know. Happy Thanksgiving! Merry Christmas! Happy New Year! I guess it's been a while. Due to some serious uploading issues, I don't have any new pictures here. However, off to the left, at the top of our favorite links, you can see one called OUR PICTURE ALBUMS. That is a link to our Shutterfly site. It has pictures from the trip Abby and I took to North Dakota, and a bunch of Christmas pictures. It also has some older pictures. December was pretty crazy around here. Dustin remodeled the bathroom the first weekend. It ended up taking much longer than one day (as he had planned). Luckily, we were only without a toilet for one day. He tore out the carpet and replaced it with tile. He also replaced the toilet, cabinets, and molding. What a huge job! It looks much better now. Dustin and I celebrated our 5th anniversary on December 13th. We actually left Abby for 2 nights!! We didn't go very far (downtown Portland), but we had a lot of fun. By the time we headed home, the snow had started. There were cars all over the side of the road! It was a slow trip, but we made it home safely. 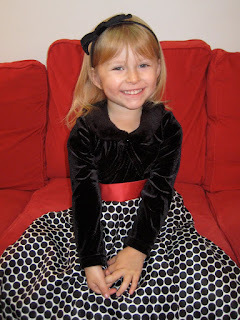 We then celebrated Christmas with Dustin's parents, since they had been up here watching Abby. There was more snow throughout the week, so Abby and I dug out a really old sled we found in the garage. Talk about fast! That thing can move! A few days later, all three of us spent the afternoon sledding. Abby had a blast! By Christmas Eve, we had 14 inches of snow. It was great fun, but hard getting around, even with chains on the car. We spent Christmas at my aunt's house in Brooks. The roads were fairly clear, but we almost couldn't get out of our parking space! We spent the afternoon eating and opening presents, and Abby got to take apart the gingerbread house they had made. We rang in the new year at Dustin's aunt's house in Clackamas. She had a cheese party. We didn't plan to stay all evening, but we were still there when the new year began. Abby was still awake and having fun, but she fell asleep within minutes of getting in the car. We've been taking life easy since then. Abby was sick last week and she still isn't sleeping well. I'm starting to feel a bit sick, myself. Today definitely felt like a Monday! I'm hoping to start updating this blog more often, but no guarantees. I know I've said that before, and it just hasn't worked out. Oh well, Happy Monday!